Porsche’s four-door luxury saloon has been around for a couple of years now. Numerous versions have passed through our news sections and overall, it has proved to be successful. Despite this, there were reservations when it first came to the market, some called it ugly, others even an abomination. 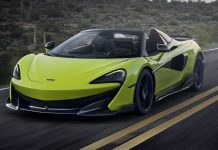 But in the end not the design, but the practicality and its inner beauty has made it a vehicle that has rewriten the book of the four-seater GT. One with performance, space and luxury, but also one which combines refinement and excellent performance for any type of journey undertaken. So what do we have here? 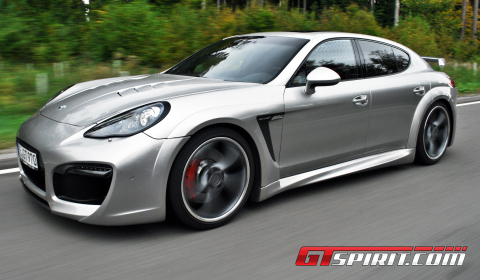 Yes, it is a tuned Porsche Panamera Turbo. Styling expert TechArt took one of the most extreme rides on the market and proved once again that they can deliver something extra-ordinary stylish, confident and uniquely sporty. The TechArt GrandGT is the final product based on the Concept One individualisation study revealed at the Geneva Motor Show in 2010. Developed to investigate the reactions of the market, customers and press, the Germans eventually decided to take the package into production with only a small number of changes. The final program was showcased at the Auto Zurich Car Show about a year ago. This fourth model in the Porsche family and our test drive for a day near Leonberg, Germany featured every single piece of kit available, such as the Sport Chrono Turbo Package, all-wheel drive, seven-speed automatic transmission, PDCC suspension system, and air suspension with additional air volume available on demand in each spring. At the heart of the Panamera Turbo beats a 4.8 liter V8 engine mounted up front and two turbochargers providing a stock 500hp at 6,000rpm and 700Nm of maximum torque between 2,250 and 4,500rpm. Push the standard sport button – enhanced with a red marking – and the TechArt powerkit TA 070/T1 provides a boost in power up to 580hp at 5,500rpm and 830Nm between 3,200 and 3,600rpm. The difference is achieved by installing an engine management box named Techtronic. The box is accompanied by a sporty exhaust system with valve control and oval dual tail pipes providing an improved V8 growl in harmony with the bold character of the GrandGT. The overall experience of the power kit is easily felt in the lower rev ranges. The additional oomph and +130Nm clearly leave their mark from lift-off, improving the sprint time to 100km/h with half a second to 3.7 seconds. The lack of performance comes into play at speeds of over 200km/h. At 210km/h-plus the massive four-wheel-drive starts to beg for more horsepower to keep the “unrealistic” acceleration of the two-ton saloon going. It continues to push forwards up to speeds of 265km/h. We know, because we drove the GrandGT on the Autobahn. The communicated top speed of 315km/h seems slightly optimistic, but with enough open road 300+ is definitely a possible scenario. 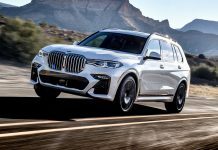 The Turbo’s performance is due, in part, to its use of an excellent ZF-sourced seven-speed PDK dual-clutch automatic, which consists of two ‘half gearboxes’ and two clutches. This system allows smooth shifts between gears in a matter of milliseconds via conventional automatic operation or manual control through steering-wheel-mounted switches. TechArt swapped these clumsy switches and installed paddle shifters behind the improved and redesigned steering wheel. It measures in at a whopping 4.9m long, 1.9m wide, and with weight of 1,970kg anybody would suggest it has the agility of the Titanic, but the GrandGT left us speechless while taking it for a sporty drive and throwing it into some short and fast corners. 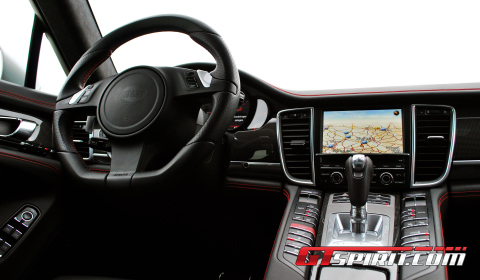 A quick tap of the Sport Plus button lowers the ride height, tightens up the suspension and sharpens the throttle response, allowing the big Porsche to bound between turns even sharper, much like a smaller sports car. 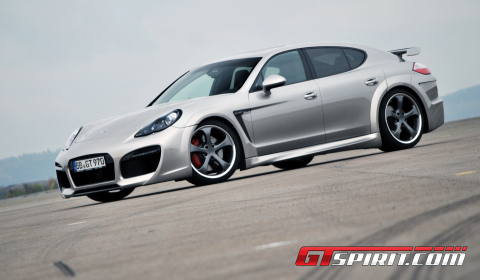 The Porsche Dynamic Chassis Control and clever rear differential are the key players in the excellent sporty ride. The car is level no matter how hard you are cornering. You can only get the car off course if you are stupid or attempt insane entry speeds. The hydraulic steering is nicely weighted and provides all the feedback you want. The new 21 inch TechArt Formula light alloy wheels were fitted with Michelin Pilot Sport tyres and provide a decent ride. They are a bigger than the stock wheels with size 265/35ZR21 at the front and 305/30ZR21 at the rear. If there is anything we could complain about it is the start/stop system and the inability to completely switch off the stability control, but these are trivial down falls only purists would fall on. In the case of the GrandGT it is not the inner beauty TechArt changed, it is the exterior presence of the massive grand tourer which got a complete make-over. The wide front bumper with integrated splitter and large ventilation intakes supply fresh air to the intercooler and brake system. The multifunctional daytime running lights combine daytime running lights, position lights, parking lights and turn signals as LED system unit in a common housing. The fenders are 21mm wider on each side of the front axle compared to the standard vehicle and 42mm on each side of the rear axle. The rear apron has integrated air openings and a matching diffuser. Other parts are the massive rear wing with adjustable gurney, carbon fiber engine hood, headlight trims and trim slats for the side air outlets. Inside the cabin, you find yourself sitting go-kart low in one of four identical, deeply contoured buckets divided by a high transmission tunnel running the length of the passenger space. The touring comfort is excellent, the quality levels are good, and the leather package by TechArt a nice addition to the setup Porsche offers. The Germans from Leonberg do offer more than just a new interior trim. Anything is possible, but unfortunately not every single option was outfitted to our GrandGT. In the end, the Porsche Panamera and TechArt’s creation, the GrandGT are not about needing, they are all about wanting. The Turbo is a remarkable high-end luxury sedan in every single way. It is incredible fast, brilliant to drive for a two-ton four-door car, and offers surprising levels of comfort and luxury. The GrandGT just adds that little bit of exterior touch to the mix increasing your desire to either love or hate it. So would we opt for one? It would definitely fit as our travelling grand tourer, but not in silvergrey.